Since we share the road with both old and new vehicles, all with a mix of technologies, the Society of Automotive Engineers created a six-level ranking system. 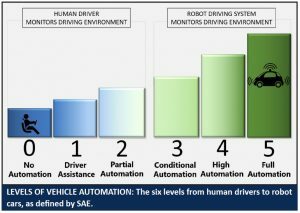 Level Zero, One and Two vehicles still require human drivers to monitor the driving environment. Level Three, Four and Five vehicles put the computer in charge of monitoring the driving environment. Only Level Three vehicles, like the Tesla, are commercially available today. But traditional manufacturers, along with new players like Google and Uber, are testing fully autonomous Level Five vehicles and predict they will be available to the public in the early 2020s. 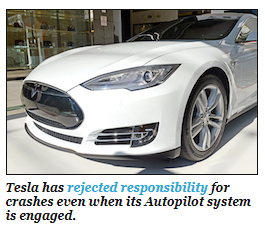 Tesla Model STesla has rejected responsibility for crashes even when its Autopilot system is engaged. The most encouraging prediction from the transition to driverless cars is a dramatic reduction in auto accidents. According to the National Highway Traffic Safety Administration (NHTSA), more than 37,000 people died in auto accidents in 2016 and millions more were injured. NHTSA estimates that 94 percent of crashes are caused by human error. A self-driving car that is never tired, distracted or impaired could dramatically reduce accidents, saving 30,000 lives or more each year. The reality, however, is that Americans will still suffer injuries and deaths from auto crashes as self-driving technology is perfected. No technology is foolproof, especially when it involves the highly complex sensors and artificial intelligence central to self-driving cars. We’ve also learned the hard way that automakers deny responsibility or cover up manufacturing defects to protect profits. And even if Level Five automation is available to the public in 2020, it will be another 15 to 20 years before all vehicles on the road have the latest self-driving technologies. 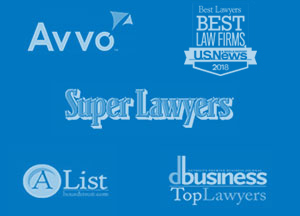 In a collision involving autonomous vehicles, the question of liability is murky at best. Is the operator at fault, the manufacturer, the software designer? Unfortunately, the trend has been to blame the operator, with manufacturers suggesting that humans should be ready to take over when self-driving systems hand over the controls. Research shows, however, that humans are not well adapted to re-engage with complex tasks, like driving in an emergency situation, once their attention has been allowed to wander. As more and more vehicles become completely driverless, it makes less and less sense to hold their human operators liable. Instead, we see strict liability as the best solution, where manufacturers take full responsibility for crashes when the robot system is driving. This same principle already applies to common carriers like bus companies, airlines or train operators, where passengers are completely dependent on the carrier for their safety. Auto insurance as we know it today would be eliminated under this scenario, because who needs an insurance policy if they’re not driving? Do your research: Cars that already have automated safety technology, such as back-up cameras or automatic braking, are already on the road today. Before you purchase a new car, review safety ratings for both the mechanical and the computer-driven technologies already on board. Stay vigilant: Just as you would if you were driving a car with no automated features, keep your attention on the road. It’s tempting to believe that once self-driving cars are introduced, you can relax your focus. Don’t exclusively rely on automated features to keep you safe. Support accountability: There are laws currently being written about liability and safety when it comes to driverless cars. Support the laws and lawmakers that insist on strict liability for autonomous vehicle manufacturers.